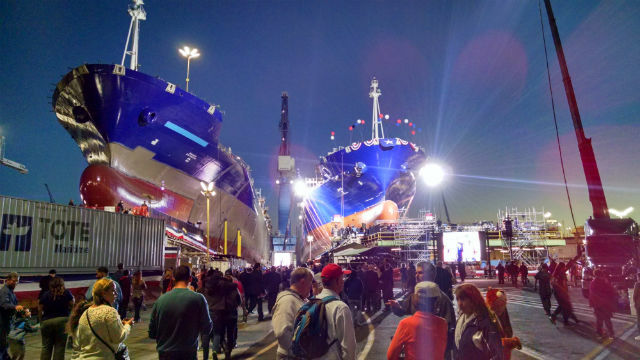 In a nighttime ceremony before 3,400 shipyard workers and dignitaries, General Dynamics NASSCO on Saturday launched the world’s first natural-gas powered container ship. 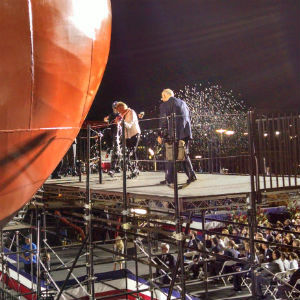 After christening by Sophie Sacco — wife of Michael Sacco, president of the Seafarers International Union — the 754-foot-long Isla Bella slid into San Diego Bay on the high tide at 9:10 p.m. Fireworks erupted as the ship floated. “Those of you in the cheap seats — this is your ship. Give yourselves a hand,” said Rep. Duncan Hunter to cheers from the thousands of workers surrounding the giant vessel at the shipyard in Barrio Logan. 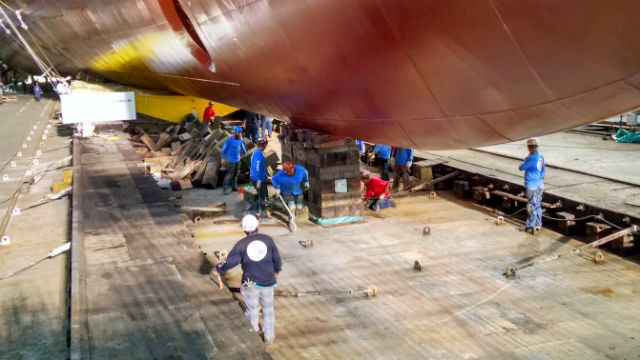 The ship was under construction for two years, and a sister ship being built nearby will be launched in August. The two ships will be used for service to Puerto Rico by New Jersey-based TOTE Maritime, a transportation and logistics company. The ship was designed by DSEC, a South Korean-based company that has partnered with NASSCO to build other commercial ships. By burning liquified natural gas, instead of the traditional bunker oil, the ship will be more efficient and significantly less polluting. The two ships represent a $750 million investment by TOTE. The company has the youngest fleet exclusively serving U.S. ports under the Jones Act, which requires American-built ships and crews. “You could not have ships like this without the Jones Act,” said Hunter after the launching.